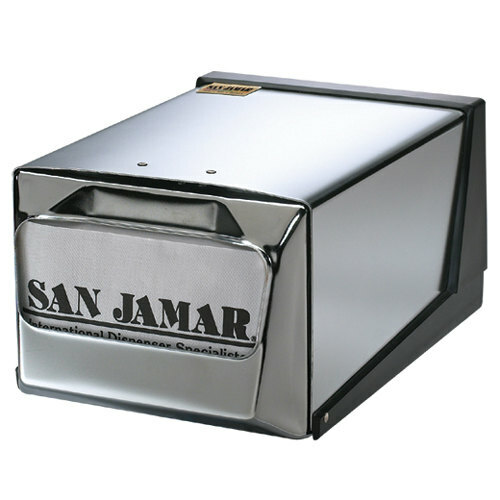 The San Jamar H3001XC fullfold countertop napkin dispenser is a convenient and practical addition to any diner, bar, or restaurant. Made of 20 gauge steel, it is strong enough to stand up to years of heavy use, and is ideal for both indoor and outdoor applications. With a 300 napkin capacity, this dispenser is ideal for seafood restaurants at the beach that offer hard-shell crabs or lobsters, or ice cream parlors with walk-up window service. The chrome body and faceplate of this item can work with almost any decor, and adds sleek modern style to any establishment. Finally, this dispenser features a high-impact plastic base that protects against corrosion in humidity and accidental spills and messes. These napkin holders were fantastic! Easy to load the napkins that we already had ordered. Simple to pull out individual napkins and very classy looking container. Thanks, Webstaurant! I bought two of these and the clamp that hold it shut broke after about a month. There is no way to fix it. total loss. Thank you for your review! A Customer Solutions Representative will be in contact to send you a replacement.